These days, there are many reasons why drivers look for temporary car insurance. Perhaps you're borrowing a friends car, or don't have a regular car on the road and need cover for a one-off journey? Whatever the occasion, an Insure 4 a Day promo code can help you save the pennies. With a choice of temporary car insurance policies lasting between 1 and 28 days, an Insure 4 a Day promotional code will get you on the road for less. Part of the Sky Insurance group founded in 1984, Insure 4 a Day was established to provide UK motorists with a quick and easy way to get instant comprehensive cover on a temporary basis. Today, they have helped over 1 million customers arrange temporary insurance for a variety of reasons, and offer a wide range of policies to suit every occasion. There are many reasons why motorists shop for temporary car insurance, from needing to drive a courtesy car while yours is undergoing maintenance to insuring a car that's normally off the road for just a week or a month or driving. Whatever the reason, Insure 4 a Day can help you get the cover you need at a competitive price. Available for all motorists between the ages of 21 and 75 who have held a full UK, EU or EEA licence for at least 12 months, their policies are flexible and affordable – aimed at getting you covered and on the road in record time. Insure 4 a Day's temporary insurance policies cover a wide range of cars of different makes and models, and are available to cover time periods of anything between 1 and 28 days. You can temporarily insure an additional driver on your own vehicle, or insure yourself to drive someone else's. 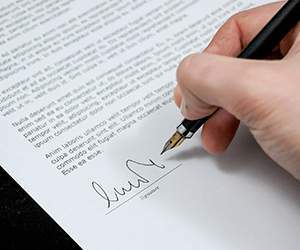 And there's no wasting time filling in endless online forms and telephoning insurance companies either – at Insure 4 a Day's website you can get an instant quote by answering a few simple questions and pay for your policy on the spot. Learning to drive and want temporary insurance to cover your vehicle? Insure 4 a Day also offers a choice of learner driver insurance policies that allow you to practice in confidence knowing that you are covered for all eventualities. And whatever policy you decide on, you'll find that all of them are covered by the company's best price guarantee – promising to match any other quote you find online. Want to get insured with Insure 4 A Day? With an Insure 4 a Day promo code you can get great deals on a wide range of temporary insurance policies. So whether you're going on holiday and want insurance to cover your trip or you've decided to drive a friend's vehicle at the last minute, an Insure 4 a Day promo code will save you money while you shop. Browse our website until you find an Insure 4 a Day promotional code that suits you, then navigate to their website to get a quote. Enter your licence and vehicle details and click 'Quote'. Choose a policy and click 'Buy now'. Enter your Insure 4 a Day promo code where applicable. 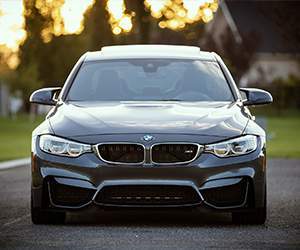 If you've enjoyed shopping for temporary car insurance with Insure 4 a Day, you might like to check out more great deals in our Automotive section. You can get permanent insurance quotes with Direct Line, or pick up discounted car accessories at stores like Halfords. Navigate to their website to get a quote. Enter your Insure 4 a Day promotional code where applicable. Need to contact the team at Insure 4 a Day? Whether you have a question about your policy, want to find out more about what your policy covers or simply want to know how you could make big savings with an Insure 4 a Day promo code, you can contact the Customer Services department by accessing the online contact centre here. 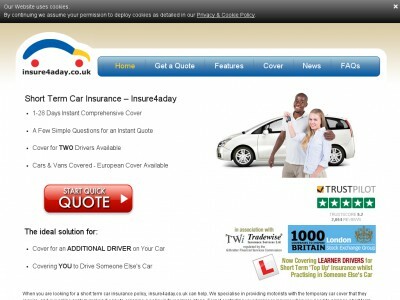 Buy now online at www.insure4aday.co.uk. Looking for short term insurance that you can rely on? Insure4aday.co.uk has got ya covered! And to make matters even better, customers can use an Insure 4 a Day promo code to do it for less! Your free Insure 4 a Day promotional codes & Insure 4 a Day electronic codes are ready and waiting for you to use, and making saving hassle free and simple to do. Be sure to pick up your Insure 4 a Day promo code to get in on the savings!